Andrew has been inventing things since he was four. His first invention was the Whoops Eraser. It was supposed to get rid of stains. But it also got rid of the things that had the stains. The Picker Upper picked up spills, but then it leaked them out again. Andrew is 10 now. And he's ready to try out his newest invention, the Atom Sucker. Is it possible to shrink something by sucking the space out of its atoms? Andrew thinks the answer is yes and his Atom Sucker can do it. Then he can get into an anthill and write the best report on ants ever! Uncle Al works at a top-secret laboratory. No one knows what he really does there. But Andrew and Judy know he's very smart and gives good presents! Thudd stands for The Handy Ultra Digital Detective. Uncle Al invented Thudd to detect signs of life on Mars and report to Earth. But something went wrong. Thudd tipped over when he walked. Thudd tripped over words when he talked. And Thudd was afraid of the dark. The rules of the laboratory were strict. The defective detective had to be recycled. Mrs. Scuttle is Judy's next-door neighbor. Mrs. Scuttle's hobby is not liking things. She doesn’t even like her dog Harley very much. He’s too messy. She doesn’t like Judy’s family. They’re too different. Then there’s Andrew. Just seeing him means trouble times two. Mrs. Scuttle may own this basset hound, but Judy throws him Frisbees and buys him chew toys. Judy and Harley are close friends. And they get much closer in Andrew Lost on the Dog! 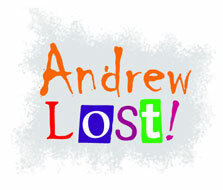 Want to read some pages from the Andrew Lost books? Click here! Drawings from the Andrew Lost series © Debbie Palen.